With iSimulate, Multi-touch, the Accelerometer, Compass and GPS are now in the iPhone Simulator. ➤ ➤ ➤ WARNING: iSimulate is ONLY for iPhone Developers. If you do not develop iPhone applications, have Xcode and have the source code of the applications, DO NOT download iSimulate. “iSimulate shines when it comes to making high quality videos of gameplay that requires multi-touch and accelerometer actions! No more Youtube videos in a dark room!” - Eric Hartzog, developer of Stick Wars. "It’s a dandy application and works as advertised." - Dan Grigsby (MobileOrchard.com). 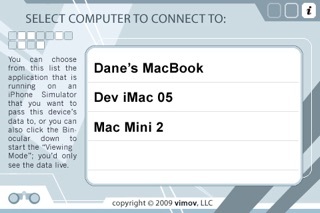 "iSimulate is a great option for developers" - Jeff Lamarche (iPhone Development Blog). 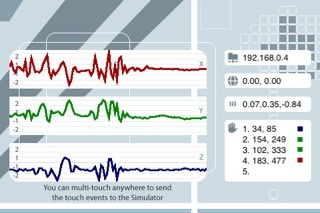 The iPhone and iPod Touch's most unique features are multi-touch and the accelerometer, but the iPhone Simulator could not help in "simulating" both. Now, with iSimulate, you can. After installing it on your iPhone or iPod Touch, it will wirelessly send multitouch events, the accelerometer data, the GPS location and more, live to your application in the iPhone Simulator. With iSimulate, you can now record stunning high quality videos for your applications and games. Not just that, but with iSimulate, you can speed up development, as running an application on the iPhone Simulator is more than 5 times faster than installing it on a device. Just add the iSimulate SDK library file to your project. You will not have to modify your code in any way. Download the SDK for free from http://www.vimov.com/isimulate/. We sincerely thank Apple for approving iSimulate to the App Store to make the lives of developers easier. iSimulate was designed to have a broad compatibility, great performance and reliability. ● Use Multi-touch, Accelerometer and Compass in the iPhone Simulator. 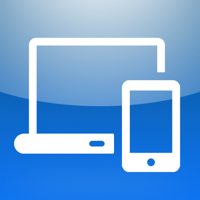 ● Record videos of your accelerometer, compass, multitouch-enabled apps (with any 3rd party screen capture tool). ● Save more than 80% of the time spent in installing applications on the device. ● Test your applications across different iPhone OS versions in the iPhone Simulator. ● Test your applications with different Device IDs. ● Seamless Integration: just add a library file to your project. No changes to your code. Q: How does iSimulate work? A: When added to your project, the iSimulate SDK library creates a listening server on your iPhone Simulator that waits for a connection from an iPhone/iPod running the iSimulate client. When such connection is established, the iSimulate client running on your iPhone/iPod captures all data from the accelerometer sensor, the touch events, the location and device ID and streams them to the server. The iSimulate SDK library then recreates all input events synthetically. This is entirely transparent to your application and does not interfere with your application's functionality. Q: Does iSimulate send all multi-touch events? A: As of iSimulate 1.5, there are no limitations on the use of UIKit. All touches are transferred to all types of UIKit objects, so you can use iSimulate to develop virtually any OpenGL or UIKit application.